Take a quick look. Do you see what’s wrong? First, the line about the summary in the front matter is colored in green. The front matter uses YAML syntax, but Neovim does not know it and thus highlights this line incorrectly. Second, the python code is OK, but the language name is misspelt: pyton instead of python. 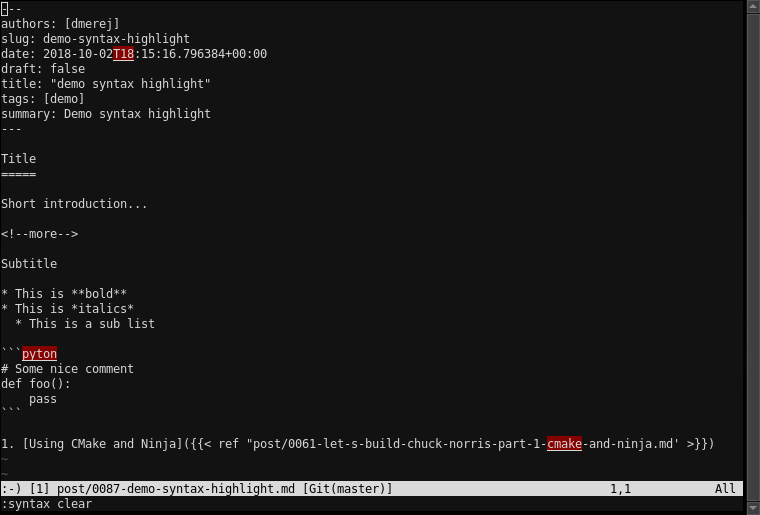 I am using Neovim’s built-in spell checker, but since Neovim “knows” the stuff after ``` is source code, it disables spell checking for this part of the text. Third, the link to ‘Using CMake and Ninja’ is built using hugo syntax, and if you were extra careful you may have noticed that the path to the article after ref starts with a double quote ("), but ends with a single quote ('). For quite some time I did not think to much about this situation, until I read A case against syntax highlighting, by Linus Åkesson. This time, the spell checker checks everything, and the typo in pyton is caught. The “rendering bug” of the front matter is gone. Also, he problem with the single quote is more obvious to spot. It’s less likely to be distracted by all the colors. That one may be subjective: it’s what my guts tell me, though. One more thing: I’m also viewing the rendered HTML in a browser next to my Neovim window. Hugo rebuilds the page I’m editing after each save, and the browser automatically reloads. First, some parts of the highlight are redundant. I’m able to see the italics in the browser, I don’t need to also view them as such in the editor. The syntax highlighting is buggy, and it will never be as good as the HTML rendering. (Especially with Markdown, where each rendering tool has its own quirks). So, why do we keep using it? 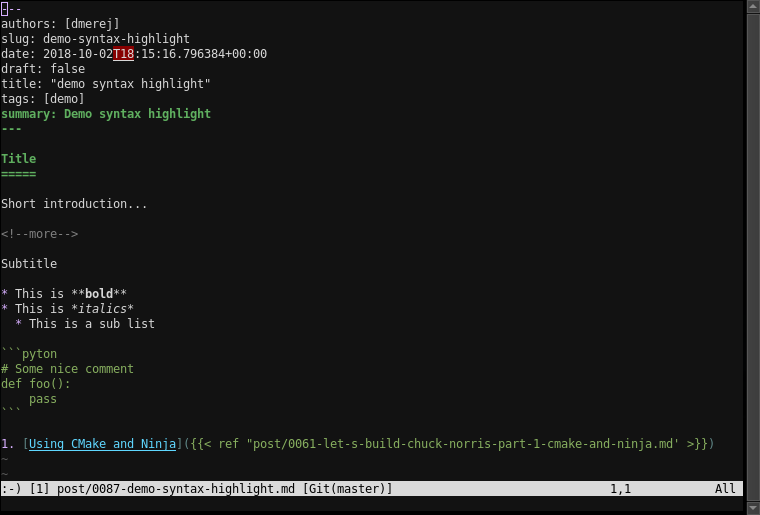 I’m still using syntax highlight in the other cases. But, in the same way the syntax highlighting may be useless (and even harmful) for editing Markdown when a HTML renderer can be used, maybe syntax highlighting is also useless if a linter can be used directly to check the code while it’s being typed.